Human Rights Activist News Agency (HRANA) – This past week has seen a sharp increase in the arrests of lawyers in Iran, many among them specialists in defending civil rights, women’s rights, and human rights activists. Nobel Peace Prize laureate Shirin Ebadi shed light on this trend in an exchange with HRANA, stating that Iranian officials and its judiciary aim to create a climate of intimidation in which citizens find it easier to turn a blind eye to government abuses of power. “[Authorities] prefer no one dare protest [their] unlawful actions,” Ebadi said. She went on to note that arrests of lawyers not only put innocent people behind bars, but they also leave the lawyer’s clients–often prisoners of conscience and other political detainees–defenseless. Ebadi drew on historical context to explain that authorities of the early Islamic Republic recognized legal scholars and independent lawyers as “nuisances,” or impediments to illicit activity, from the outset. This wariness on the part of the Iranian authorities led an appointee of the Judiciary to close the Iranian Bar Association for 18 years. When authorities finally sanctioned elections for the Bar Association’s new board of directors, their permission roughly coincided with the passing of a law mandating all members be pre-approved by a Judiciary-controlled organ called the Disciplinary Court of Judges. Ebadi cites this filtering as the reason behind the Bar Association’s lack of autonomy, as it is known to refrain from advocating for its arrested members. The following is a list of legal practitioners affected by this recent wave of repression. Nasrin Sotoudeh was among the first lawyers arrested on June 13th of this year. She was arrested in her home and subsequently taken to Evin Prison. According to lawyer Payam Derafshan, who was arrested himself on August 31st and has since been released, Sotoudeh is being held on three counts: a five-year sentence for espionage, which does not figure on her formal charge sheet; a lawsuit brought by a prosecutorial interrogator in the central Iranian city of Kashan; and an arrest order issued by Branch 2 of the Interrogations Unit. Sotoudeh declared hunger strike on August 25th to protest both her arrest and the judicial pressures being placed upon her family, relatives, and friends. Soltani’s September 10, 2011 arrest was followed by a sentence of 18 years in prison and a 20-year ban from the Iranian bar association. According to an Iranian court, his trespasses include his acceptance of the Nuremberg International Human Rights Award, statements he made to the media about his casework, and his role as co-founder of the Center for Supporters of Human Rights (CSHR). Soltani’s prison sentence was reduced to 13 years in an appeals court. Pursuant to the principle of concurrent sentences per Article 134 of the Islamic Penal Code, his sentence was reduced again to 10 years, and his 20-year Bar-association ban was reduced to two. Years of enduring poor living conditions in prison, including being cut off from nutritious food and [potable] water, have taken a toll on Soltani: he now suffers from a host of health issues including broken teeth, anemia, irritable bowel syndrome, and [abnormal] blood pressure fluctuations. While Soltani was in prison, his daughter Homa died of a heart attack on August 3rd at the age of 27. He was granted restricted furlough to attend her funeral. On August 18th, a number of protestors were detained during a public demonstration before Tehran’s Parliament building in protest to both the Caspian Sea treaty and the vetting of election candidates by the Guardian Council. Three lawyers–Ghasem Sholeh-Saadi, Arash Kaykhosravi, and Masoud Javadieh–were among those detained. Several arrestees were released within hours, and Javadieh was released on bail the following day. Sholeh-Saadi and Kaykhosravi, facing charges from Branch 5 of the Evin prosecutor’s office, were sent to Great Tehran Penitentiary. On August 21st, Sholeh-Saadi and Kaykhosravi, were sent again to the Evin prosecutor’s office, shackled and in prison garb. They were read their charges (“gathering and collusion against national security”), issued a one-month arrest order, and returned to prison. Sholeh-Saadi is a legal scholar and former member of parliament. He had previously been convicted and jailed for “insulting the Supreme Leader” in a letter he infamously published in 2002. Kaykhosravi has taken on such high-profile cases as that of lawyer Mohammad Najafi and Kavous Seyed Emami, the university professor and environmental activist who died in Evin Prison on February 8th. Prison authorities claimed Emami had committed suicide. Kaykhosravi has since been transferred to Evin Prison. Attorneys Payam Dorafshan and Farrokh Forouzan were arrested in the home of their imprisoned colleague Arash Kaykhosravi on August 31st. Dorafshan was among a group of lawyers suing Bijan Ghasemzadeh, interrogator in Branch Two of the Culture and Media court, for his decision to ban the popular messaging app Telegram. Forouzan works in children’s rights. Both have since been released. The reason for their arrest remains unclear. On July 29th, Branch 102 of the Second Criminal Court in the central Iranian city of Arak sentenced lawyer Mohammad Najafi and dozens of other citizens to prison terms for participating in January’s Shazand County protests. Najafi was convicted of “disrupting order and public peace by taking part in illegal gatherings” and sentenced to one year in prison plus 74 lashes. Prior charges of “publishing false information to disrupt the public conscience” brought the prison sentence to a total of two years. Najafi is among those investigating the death of a protestor in January’s Shazand protests. He publicly spoke out about the death of Vahid Heydari, a citizen who died while in the custody of authorities after being arrested in Arak. Lawyer Zaynab Taheri was arrested on June 19th, one day after the execution of her client Mohammadreza Salas Babajani, a Sufi Dervish prisoner convicted of killing three police officers. She had publicly advocated for Babajani on social media. She was arrested by the Culture and Media court and convicted of both “publishing falsehoods to disrupt the public conscience” and “propaganda against the regime.” She was released on bail August 8th. On August 31st, the International Federation of Human Rights, known by its French acronym FIDH, expressed concern over the harassment of Taheri by judicial authorities, asking Iranian officials to cease their harassment of her and other human rights defenders. Taheri’s clients included Salas Babajani, Mohammad Ali Taheri, and Ahmadreza Jalali. On the morning of September 10th, security forces arrested Hoda Amid in her home along with Najmeh Vahedi, another women’s rights activist with a formal education in sociology who was with Amid at the time. Amid and Vahedi are known to have organized educational training workshops for women inquiring about their rights in marriage contracts. The precise reason for Amid’s arrest and her current status remain unknown. HRANA News Agency – Amnesty‎ International; Anyone held in Iran solely for the peaceful exercise of their human rights should immediately and unconditionally be released, Amnesty International has said, following the pardoning by Iran’s Supreme Leader Ayatollah Ali Khamenei of at least 130 political prisoners, including prisoners of conscience, from Tehran’s Evin Prison. Amnesty International and the International Commission of Jurists (ICJ) today condemned the ongoing arrests and imprisonment of several prominent lawyers in Iran which they see as part of an orchestrated attempt by the Iranian authorities to repress dissent in the country. The two organizations are calling for the immediate and unconditional release of lawyers Nasrin Sotoudeh, Mohammad Seyfzadeh, Maedeh Ghaderi, and Ghasem Sholeh Saadi, who are detained arbitrarily in violation of Iran’s obligations under international law. They are prisoners of conscience, held solely for the peaceful exercise of their rights to freedom of expression and association, or for their work as defence lawyers. The two organizations are also calling for the conviction of Khalil Bahramian, a lawyer sentenced for publicly expressing his views about flaws in the judicial process in the cases of some of his clients who were executed, to be overturned, as he would be a prisoner of conscience if imprisoned. In addition, the organizations are seeking clarification of the current legal status of Javid Houtan Kiyan, a lawyer who represented Sakineh Mohammadi Ashtiani, a woman sentenced to death by stoning for “adultery while married”, including any charges brought against him and any sentences imposed. If – as appears – he is held solely for the peaceful exercise of his right to freedom of expression, including in connection with his work as a defence lawyer on behalf of Sakineh Mohammadi Ashtiani, he should be released immediately and unconditionally. The allegations that he has been tortured while in detention should be investigated immediately and anyone found responsible for abuses brought to justice. 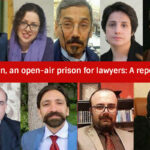 The recent targeting of lawyers, notably those who defend political prisoners and prisoners facing the death penalty, is part of the Iranian government’s ongoing crackdown on civil society following the post-June 2009 election unrest in the country. By targeting defence lawyers, the Iranian authorities are limiting access to competent legal representation, a basic right and important fair trial guarantee. The two organizations welcome the recent release on 19 April 2011 of prisoner of conscience Mohammad Oliyaeifard, a defence lawyers and a board member of the Committee for the Defence of Political Prisoners in Iran, a human rights organization, after serving the complete one year prison sentence imposed for speaking out against the execution of one of his clients during interviews with international media. His client, juvenile offender Behnoud Shojaee, had been hanged for a murder he committed when he was 17 years old. Mohammad Oliyaeifard has also defended many prisoners of conscience, including independent trade unionists, as well as juvenile offenders. However, Amnesty International and the ICJ condemn the increasing number of lawyers who face or who have been convicted of vaguely worded charges stemming from their peaceful exercise of their rights to freedom of expression and association and their work as lawyers. Nasrin Sotoudeh, the defence lawyer of Mohammad Oliyaeifard, is herself currently imprisoned in Tehran’s Evin Prison. She was arrested on 4 September 2010 after she presented herself in compliance with a court summons. A mother of two young children, Nasrin Sotoudeh was sentenced on 9 January 2011 to 10 years on the charge of “acting against national security, including membership of the Centre for Human Rights Defenders (CHRD)” (a human rights organization forcibly closed by the authorities) and one year for “propaganda against the system” and has been banned from practising law and leaving the country for 20 years. Another prominent lawyer, Mohammad Seyfzadeh, is believed to remain held by Ministry of Intelligence officials in a detention facility in Oroumieh in north-west Iran. He was arrested on new charges on 11 April 2011 for allegedly attempting to leave the country illegally, and was held in conditions amounting to enforced disappearance for around two week, as he was not permitted to contact anyone until 21 April when he contacted his family. On 23 April 2011 Mohammad Seyfzadeh’s lawyer and son attempted to visit him in Oroumieh, but only his son was permitted a visit, lasting approximately two minutes. During this visit Mohammad Seyfzadeh is reported to have been limping and had lost weight. Mohammad Seyfzadeh had previously been sentenced on 30 October 2010 to nine years’ imprisonment for “forming an association… whose aim is to harm national security” and “being a member of an association whose aim is to harm national security” in relation to the Centre for Human Rights Defenders CHRD, a human rights organization he co-founded with Nobel Peace Laureate Shirin Ebadi and others. He was also sentenced to a 10-year ban on practising law, despite the fact that only the Disciplinary Court for Lawyers may impose such professional bans, This sentence remains under review by Branch 54 of the Tehran Appeals Court. He was banned from leaving the country in 2009. Maedeh Ghaderi, a member of Iran’s Kurdish minority, is a lawyer based in Mashhad, north-east Iran. She was arrested on or about 2 March 2011. Maedeh Ghaderi had been representing her husband, Ali Parandian, a member of the opposition Green Movement who was arrested in January 2011. It is not known whether Ali Parandian has had access to any other lawyer since his wife’s arrest. She went on hunger strike in mid-April 2011 to protest at her continuing detention without charge or trial, after which unconfirmed reports suggested that she and her husband are under investigation by Branch 904 of the Revolutionary Court in Mashhad on suspicion of contacts with the Party For Free Life of Kurdistan, a Kurdish armed group known by its Kurdish acronym PJAK. PJAK was formed in 2004, and carried out armed attacks against Iranian security forces, but declared a unilateral ceasefire in 2009, although it still engages in armed clashes with security forces in what it terms “self-defence”. University professor, lawyer, and former Member of Parliament Ghasem Sholeh Saadi was arrested on 3 April 2011 at Tehran’s Mehrabad Airport after a flight from Shiraz and taken to Tehran’s Evin Prison. Ghasem Sholeh Saadi had sought to run as a candidate for president during the June 2009 elections, but was not approved by the Council of Guardians, which screens candidates for popular election under discriminatory selection procedures. Ghasem Sholeh Saadi had previously been detained for 36 days at Evin Prison in Tehran in 2003 following a critical open letter he wrote to the Supreme Leader Ayatollah Sayed ‘Ali Khamenei in 2002. Amnesty International and the ICJ understand that Ghasem Sholeh Saadi was sentenced to one-and-a-half years’ imprisonment in June 2006 on charges stemming from this letter, which was upheld on appeal, and then overturned by the Head of the Judiciary, who sent the case for retrial, although this is not known to have taken place. According to reports, Ghasem Sholeh Saadi was nevertheless told on arrest that this was the reason for his detention. After his arrest, Ghasem Sholeh Saadi was also informed that a new one-year sentence had been passed against him, along with a 10-year ban on teaching and a 10-year ban on practising law, apparently imposed for interviews he had given to foreign media. Khalil Bahramian, who has represented many political prisoners, including some on death row – such as Sherko Moarefi, a member of Iran’s Kurdish minority who is at risk of imminent execution – was sentenced in February 2011 to 18 months in prison and banned from the practice of law for 10 years by Branch 28 of Tehran’s Revolutionary Court on charges of “propaganda against the system” and “insulting the Head of the Judiciary”. Khalil Bahramian has been practising law in Iran for 46 years. He is currently free pending appeal against this sentence. Javid Houtan Kiyan, a member of Iran’s Azerbaijani minority, is a lawyer based in Tabriz, north-west Iran, who represented Sakineh Mohammadi Ashtiani, a woman sentenced to death by stoning for “adultery while married”. He was arrested on 10 October 2010 in his office along with Sajjad Qaderzadeh, Sakineh Mohammadi Ashtiani’s son and two German journalists who were conducting an interview with them about her case. Sajjad Qaderzadeh was released on bail in December 2010, and the German journalists were released in February 2011 after being sentenced to a fine. In March 2011, a letter attributed to Javid Houtan Kiyan alleged that he was tortured while held in solitary confinement in Section 209 of Evin Prison from 11 October to 12 December 2010. Since 1 November 2010, when a prosecutor said that he was held on suspicionof having three forged or duplicate ID cards, the Iranian authorities have given no information concerning his legal situation. Other sources have since suggested that he has been sentenced to between one to 11 years in prison on various charges, and may still be facing other charges. Most – if not all – of these appear to relate to his defence of Sakineh Mohammadi Ashtiani. Principle 16 of the UN Basic Principles on the Role of Lawyers provides that lawyers must be allowed to carry out their work “without intimidation, hindrance, harassment or improper interference.” Principle 18 states that lawyers “shall not be identified with their clients or their clients’ causes as a result of discharging their functions”. In addition, Principle 25 affirms the right of lawyers to freedom of expression, also provided for in Article 19 of the International Covenant on Civil and Political Rights, which includes “the right to take part in public discussion of matters concerning the law, the administration of justice and the promotion and protection of human rights”. The UN Special Rapporteur on the Independence of Lawyers and Judges has not been permitted to visit the country despite the Standing Invitation issued by Iran to all UN human rights mechanisms in 2002.